Resilient communities see the future as both challenge and opportunity. Most importantly, resilient communities do not wait for the future to happen. They embrace it by adapting, organising and innovating to ensure that the key factors determining their quality of life are moulded locally. Our world is shaped significantly by new and emerging trends spanning the economy, society, and the natural environment. A prosperous and thriving future for regional Australians will depend on our response to these trends, the pathways we create, and how imaginatively we exploit opportunity and manage the risks that come with change. With informed, enabled and inclusive strategies, our communities can take on the future confidently. Over time they can also become more resilient by acquiring new skills and technologies, mastering the transition to a low carbon economy and adapting to changing climate – all while creating the new jobs of tomorrow. Here in Queensland the State Government is seeking to assist communities navigate these global transitions for long term viability and sustainability. Through its Department of Environment and Science, the Palaszczuk Government has launched a program called ‘Communities in Transition’ . The aim is to engage proactively with Queenslanders to help deal with the challenges of climate change adaptation. Specifically, Communities in Transition aims to help Queensland communities identify the steps necessary to build economic prosperity while also a chieving the goal of zero net greenhouse emissions by 2050. Those communities most locally aware, willing to draw on all their resources, self-organise and collaborate to learn, adapt and develop sustainably – are the resilient communities that will be the Queensland of the future. They will be the communities making Clean Growth Choices. What is ‘Clean Growth Choices’? For those future-focused communities planning to embrace the economic and social innovation needed to achieve the low carbon transition, future prosperity will be best assured by making clean growth choices. These will be the decisions or choices that create new sources of value and new business opportunities by increasing resource efficiency, using cleaner energy, and leaving smaller environmental footprints. They will be the choices made also in education and training, sourcing investment, setting vision for regional development, and accessing new markets. Inspired by the imperatives and challenges facing communities, Clean Growth Choices (CGC) has been designed as a community development process to strengthen resilience and navigate successfully the transition to a low carbon economy. Designed by a consortium comprised of highly qualified and experienced experts with strong track record helping communities, business and government develop and implement community resilience strategies, at its core CGC is a robust, futures focused, road-mapping framework grounded in place, community and region. 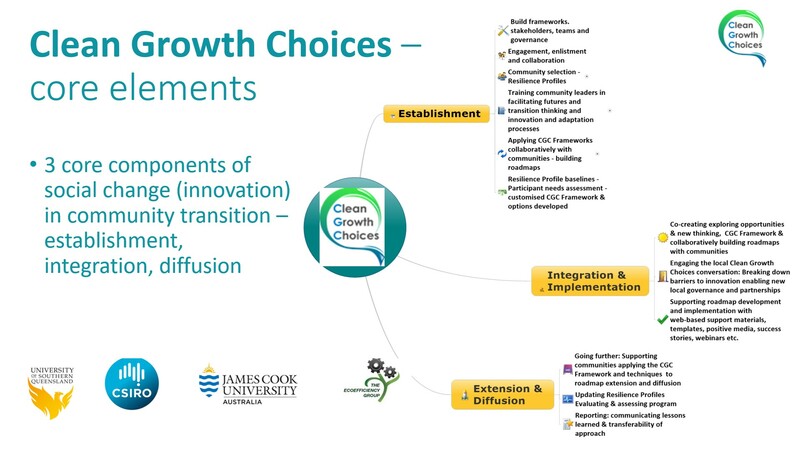 Clean Growth Choices assumes that the factors framing community transitions will closely reflect the resilience of each community across heritage and culture, skills and knowledge, resources, infrastructure, location and economy. Each community will transition uniquely. To help them along the way, the Clean Growth Choices platform provides expert knowledge, tools and resources, collaborative networks, and links to external sources of support and potential investment. A crucial methodological input to the program has been the RAPTA (Resilience, Adaptation Pathways and Transformation Assessment) framework developed by CSIRO to achieve more valuable and durable outcomes for communities grappling with major change, volatility and uncertainty. The result is a framework for communities to set their own directions, navigate their own pathways, and come up with strategies conceived and implemented by the participants themselves. This is achieved by assisting communities with training in the latest future visioning and transition planning techniques as well as ongoing practical support to create transition road-maps addressing local needs and opportunities. By using the Clean Growth Choices toolkit, local leaders will be able to work more effectively with their communities to envision the future – its possibilities, risks, and decisions about the best way forward. Delivered by dedicated program and engagement managers, Clean Growth Choices is able to provide participating communities with access to support and advice when and where they need it. Taking up the challenge of a future founded on Clean Growth Choices is an act of leadership, starting with local government, business and community groups. Clean Growth Choices communities will join a network of other communities collaborating to strengthen their economic and social resilience by managing the risks of climate change as well as generating new skills, jobs and economic opportunities. All participating communities are able to access the resources and expertise of the CGC consortium as well as relevant government programs. Access a rich array of enabling resources from the CGC team, web site, and extended network supporting the goals of the Communities in Transition program.